Create a healthier enviroment for you and your family with this low energy 16L dehumidifier from ElectriQ. Suitable for flats and homes up to 4 bedrooms, this powerful yet incredibly energy efficient dehumidifier provides a cost effective solution in combating damp, mould and condensation. It works by removing excess moisture and humidity in the air which can encourage the growth of common allergens that maybe damaging to a person's health and home. Allergens can be anything from dust mites and pollen to mould and bacteria. This efficient dehumidifier is perfect for using at night when sleeping thanks to its ultra-low noise level. It's engineered with some very clever technology that saves you 40% of the running costs compared with standard dehumidifiers. There's also a timer function that can be set to automatically switch on/off at a convenient time - so you can have it run while you're sleeping, at work, or at an off peak electricity period to futher reduce operating costs. For complete protection, this dehumidifier features an anti-bacterial filter to trap any unwanted bacteria in the air so that you breathe cleaner, fresher air - ideal for those with breathing difficulties or allergies. The filter is washable so you don't have to fork out money on having to replace the filter every couple of months, simply give it a quick rinse with some hot soapy water and use again. The water tank is large enough to hold up to 4 litres of water and you don't need to worry about it over flowing because the unit will stop once the tank is full. The Intelligent humidistat control logic ensures maximum water extraction with minimum power use. 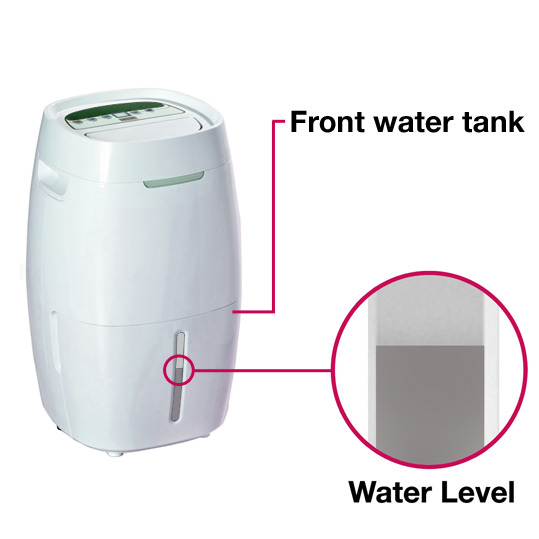 The water tank is cleverly positioned at the front of the dehumidifier for quick and easy access. The CD16LE can also be set up for continuous draining by connecting a hose into the drain outlet at the back.